Directive 2010/30/EU requires the Commission to adopt delegated acts as regards the labelling of energy-related products representing significant potential for energy savings and having a wide disparity in performance levels with equivalent functionality. Provisions on the energy labelling of household dishwashers were established by Commission Directive 97/17/EC of 16 April 1997 implementing Council Directive 92/75/EEC with regard to energy labelling of household dishwashers (2). The electricity used by household dishwashers accounts for a significant share of total household electricity demand in the Union. In addition to the energy efficiency improvements already achieved, the scope for further reducing the energy consumption of household dishwashers is substantial. Directive 97/17/EC should be repealed and new provisions should be laid down by this Regulation in order to ensure that the energy label provides dynamic incentives for suppliers to further improve the energy efficiency of household dishwashers and to accelerate the market transformation towards energy-efficient technologies. The information provided on the label should be obtained through reliable, accurate and reproducible measurement procedures, which take into account the recognised state-of-the-art measurement methods including, where available, harmonised standards adopted by the European standardisation bodies, as listed in Annex I to Directive 98/34/EC of the European Parliament and of the Council of 22 June 1998 laying down a procedure for the provision of information in the field of technical standards and regulations and of rules on Information Society services (3). This Regulation should specify a uniform design and content for the label for household dishwashers. In addition, this Regulation should specify requirements as to the technical documentation and the fiche for household dishwashers. Moreover, this Regulation should specify requirements as to the information to be provided for any form of distance selling, advertisements and technical promotional materials for household dishwashers. It is appropriate to provide for a review of the provisions of this Regulation taking into account technological progress. In order to facilitate the transition from Directive 97/17/EC to this Regulation, it is appropriate to provide that household dishwashers labelled in accordance with this Regulation are to be considered compliant with Directive 97/17/EC. This Regulation establishes requirements for the labelling of and the provision of supplementary product information on electric mains-operated household dishwashers and electric mains-operated dishwashers that can also be powered by batteries, including those sold for non-household use and built-in household dishwashers. ‘point of sale’ means a location where household dishwashers are displayed or offered for sale, hire or hire-purchase. any technical promotional material concerning a specific model of household dishwasher which describes its specific technical parameters includes the energy efficiency class of that model. any technical promotional material concerning a specific model of household dishwasher which describes its specific technical parameters includes a reference to the energy efficiency class of that model. The information to be provided pursuant to Articles 3 and 4 shall be obtained by reliable, accurate and reproducible measurement methods, which take into account the recognised state-of-the-art measurement methods. 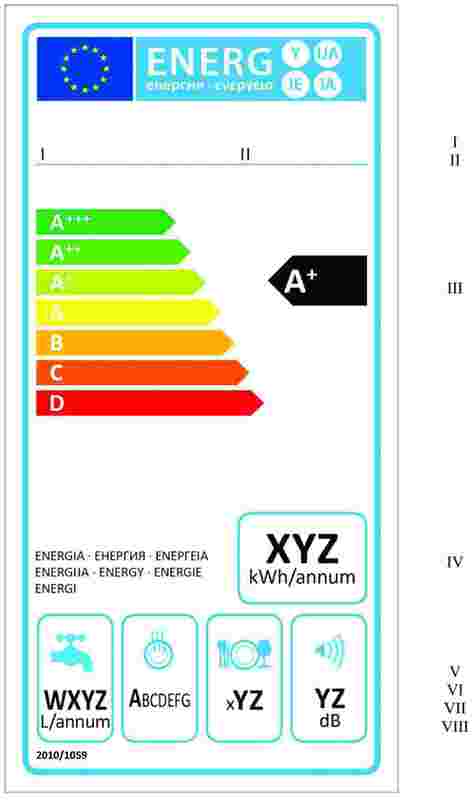 Member States shall apply the procedure laid down in Annex V when assessing the conformity of the declared energy efficiency class, the annual energy consumption, annual water consumption, drying efficiency index, programme time, power consumption in off-mode and left-on mode, duration of the left-on mode and airborne acoustical noise emissions. The Commission shall review this Regulation in the light of technological progress no later than four years after its entry into force. The review shall in particular assess the verification tolerances set out in Annex V.
Directive 97/17/EC shall be repealed from 20 December 2011. 1. Articles 3(d), (e), 4(b), (c) and (d) shall not apply to printed advertisement and printed technical promotional material published before 30 March 2012. 2. Household dishwashers placed on the market before 30 November 2011 shall comply with the provisions set out in Directive 97/17/EC. 3. If an implementing measure for Directive 2009/125/EC of the European Parliament and of the Council (4) with regards to ecodesign requirements for household dishwashers was adopted, household dishwashers which comply with the provisions of this implementing measure with respect to the cleaning efficiency requirements and with the provisions of this Regulation, and which are placed on the market or offered for sale, hire or hire-purchase before 20 December 2011 shall be regarded as complying with the requirements of Directive 97/17/EC. It shall apply from 20 December 2011. However, Articles 3(d), (e), 4(b), (c) and (d) shall apply from 20 April 2012. Done at Brussels, 28 September 2010. (2) OJ L 118, 7.5.1997, p. 1. (4) OJ L 285, 31.10.2009, p. 10.
airborne acoustical noise emissions expressed in dB(A) re 1 pW and rounded to the nearest integer. The design of the label shall be in accordance with point 2. By way of derogation, where a model has been granted an ‘EU Ecolabel’ under Regulation (EC) No 66/2010 of the European Parliament and of the Council (1), a copy of the EU Ecolabel may be added. The design of the label shall be as in the figure below. The label shall be at least 110 mm wide and 220 mm high. Where the label is printed in a larger format, its content must nevertheless remain proportionate to the specifications above. Colours shall be CMYK — cyan, magenta, yellow and black, following this example: 00-70-X-00: 0 % cyan, 70 % magenta, 100 % yellow, 0 % black. Border stroke: 5 pt — colour: Cyan 100 % — round corners: 3,5 mm. EU logo — colours: X-80-00-00 and 00-00-X-00. colour: X-00-00-00. Pictogram as depicted; EU logo and energy logo (combined): width: 92 mm, height: 17 mm. Sub-logos border: 1 pt — colour: Cyan 100 % — length: 92,5 mm. Text: Calibri bold 18 pt, capitals and white; ‘+’ symbols: Calibri bold 12 pt, capitals, white, aligned on a single row. Arrow: width: 26 mm, height: 14 mm, 100 % black. Text: Calibri bold 29 pt, capitals and white; ‘+’ symbols: Calibri bold 18 pt, capitals, white, aligned on a single row. Text: Calibri regular 11 pt, capitals, 100 % black. Border: 2 pt — colour: Cyan 100 % — round corners: 3,5 mm. Value: Calibri bold 37 pt, 100 % black. Second line: Calibri regular 17 pt, 100 % black. Value: Calibri bold 24 pt, 100 % black; and Calibri regular 16 pt, 100 % black. Value: Calibri regular 16 pt, horizontal scale 75 %, 100 % black; and Calibri bold 22 pt, horizontal scale 75 %, 100 % black. The supplier’s name or trademark and model identifier should fit in a space of 92 × 15 mm. Numbering of the Regulation: Calibri bold 9 pt, 100 % black. if the household dishwasher is intended to be built-in, an indication to this effect. One fiche may cover a number of household dishwasher models supplied by the same supplier. The information contained in the fiche may be given in the form of a copy of the label, either in colour or in black and white. Where this is the case, the information listed in point 1 not already displayed on the label shall also be provided. the results of calculations performed in accordance with Annex VII. Where the information included in the technical documentation file for a particular household dishwasher model has been obtained by calculation on the basis of design, or extrapolation from other equivalent household dishwashers, or both, the documentation shall include details of such calculations or extrapolations, or both, and of tests undertaken by suppliers to verify the accuracy of the calculations undertaken. The information shall also include a list of all other equivalent household dishwasher models where the information was obtained on the same basis. if the model is intended to be built-in, an indication to this effect. Where other information contained in the product fiche is also provided, it shall be in the form and order specified in Annex II. The size and font in which all the information referred in this Annex is printed or shown shall be legible. For the purposes of checking conformity with the requirements laid down in Articles 3 and 4, Member State authorities shall test a single household dishwasher. If the measured parameters do not meet the values declared by the supplier within the ranges set out in Table 1, the measurements shall be made on three more household dishwashers. The arithmetic mean of the measured values of these three household dishwashers shall meet the values declared by the supplier within the range defined in Table 1, except for the energy consumption, where the measured value shall not be greater than the rated value of Et by more than 6 %. Otherwise, the model and all other equivalent household dishwasher models shall be considered not to comply with the requirements laid down in Articles 3 and 4. Member State authorities shall use reliable, accurate and reproducible measurement procedures, which take into account the generally recognised state-of-the-art measurement methods, including methods set out in documents, the reference numbers of which have been published for that purpose in the Official Journal of the European Union. The measured value shall not be greater than the rated value (1) of AEC by more than 10 %. The measured value shall not be greater than the rated value of Wt by more than 10 %. The measured value shall not be less than the rated value of ID by more than 19 %. The measured value shall not be greater than the rated value of Et by more than 10 %. The measured value shall not be longer than the rated values Tt by more than 10 %. The measured value of power consumption Po and Pl of more than 1,00 W shall not be greater than the rated value by more than 10 %. The measured value of power consumption Po and Pl of less than or equal to 1,00 W shall not be greater than the rated value by more than 0,10 W.
The value measured shall not be longer than the rated value of Tl by more than 10 %. The measured value shall meet the rated value. (1) ‘Rated value’ means a value declared by the supplier. 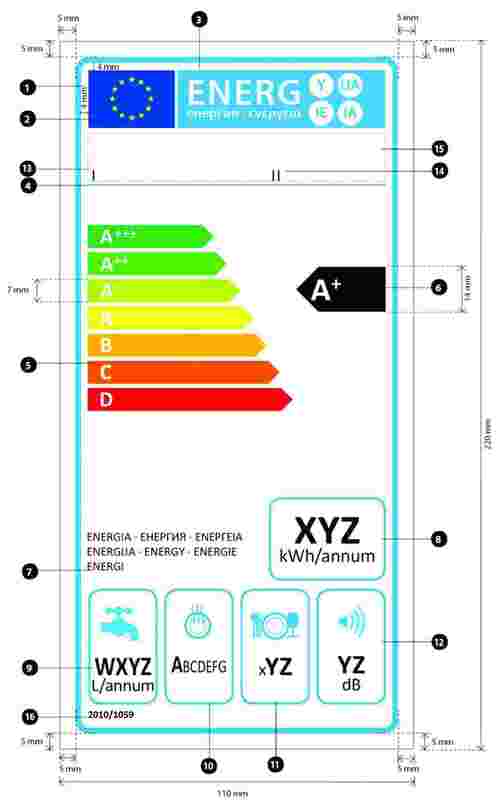 The energy efficiency class of a household dishwasher shall be determined on the basis of its Energy Efficiency Index (EEI) as set out in Table 1. The Energy Efficiency Index (EEI) of a household dishwasher shall be calculated in accordance with point 1 of Annex VII. The drying efficiency class of a household dishwasher shall be determined on the basis of its Drying Efficiency Index (ID ) as set out in Table 2. The Drying Efficiency Index (ID ) shall be calculated in accordance with point 2 of Annex VII. For the calculation of the Energy Efficiency Index (EEI) of a household dishwasher model, the annual energy consumption of the household dishwasher is compared to its standard annual energy consumption. standard annual energy consumption of the household dishwasher. total number of standard cleaning cycles per year. For the calculation of the Drying Efficiency Index (ID ) of a household dishwasher model, the drying efficiency of the household dishwasher is compared to the drying efficiency of a reference dishwasher, where the reference dishwasher shall have the characteristics indicated in the generally recognised state-of-the-art measurement methods, including methods set out in documents, the reference numbers of which have been published for that purpose in the Official Journal of the European Union. number of test cycles, n ≥ 5.
water consumption for the standard cleaning cycle, in litres and rounded to one decimal place.